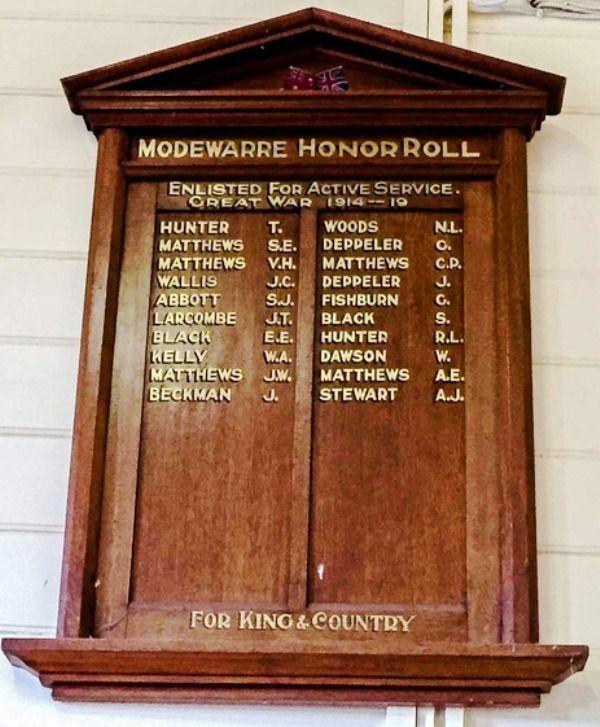 Fully two hundred residents attended at the State School on Friday afternoon for the double purpose of celebrating Empire Day and witnessing the unveiling of the roll which had been placed in the school in honor of twenty young men, all of this district at the time of enlistment. Mr. D. M'Lennan, M.L.A., in a very suitable address, performed the unveiling ceremony and complimented the residents on the very fineresponse of the district young men to their country`s call. Rev. Simmonds, Crs. Hunt and Black also spoke very approprietely. Afternoon tea was served by the ladies. Geelong Advertiser (Vic), 28 May 1918.